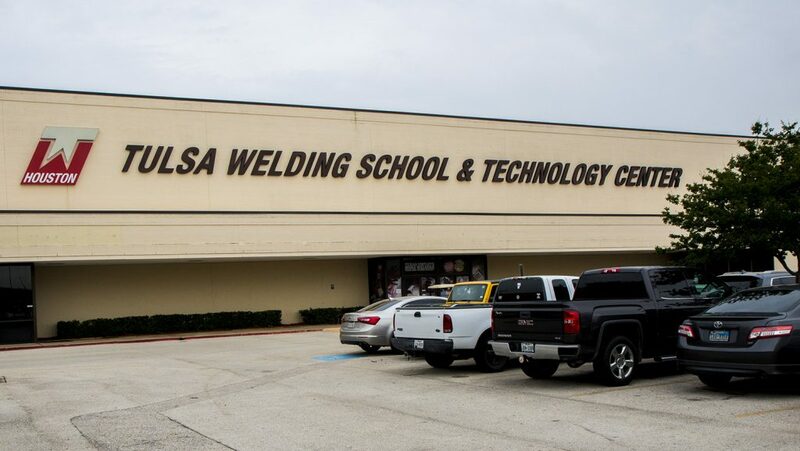 Plasma Cutting Fume Extractor - Sentry Air Systems, Inc.
At Tulsa Welding School, located in North Houston, test pieces for student use are cut using a plasma cutting system. These test pieces are 3” x 6” and are cut all day during two shifts from 8 AM to 11 PM. Because of the high use of cutting, the plasma cutting room is very dirty and smoky. To cut down on smoke and particulate, a Model 500 Python Heavy Duty Portable Plasma Cutting Fume Extractor was installed on the cutting table. Operator plasma cutting student test pieces at Tulsa Welding School with plasma cutting fume extractor installed. Plasma cutting is a process that utilizes a burst of air containing a collection of charged particles used to cut through electrically conductive materials such as steel, stainless steel, aluminum, brass and copper. Plasma cutting offers high speed and low cost with high precision cutting ability. However, this process does produce fine particulate dust and fumes which can be harmful to the operator. 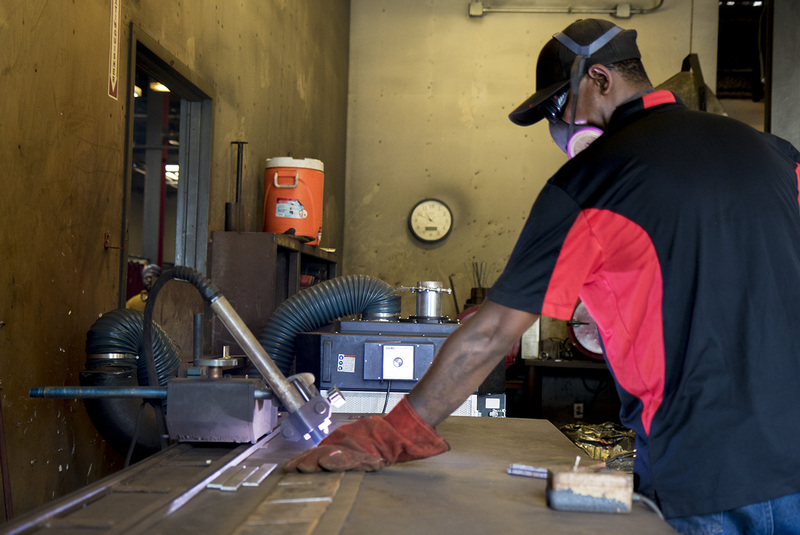 Depending on the metal being cut, different health effects may occur from exposure to particulate dust from plasma cutting. OSHA regulates the exposure limit for operators. Here are a few of the materials typically cut by a plasma cutter. Hexavalent Chromium – This by product of stainless steel has a permissible exposure limit2 (PEL) of 5 µg/m3 (0.005 mg/m3) and HEPA filtration is recommended. Hexavalent chromium exposure can result in lung, eye or skin irritation with long term exposure possibly causing lung cancer or damage to the upper respiratory system1. Zinc Oxide – A byproduct of galvanized steel, zinc oxide has a PEL2 of 5 mg/m3 with overexposure causing metal fume fever. Metal fume fever causes severe flu like symptoms after a break is taken from work1. Manganese – Manganese comes from some steel alloys and has a PEL2 of 0.2 mg/m3. Exposure to manganese can cause exhaustion, apathetic attitude, weakness, and headaches. Long term exposure can cause manganism which is characterized by the neurological and neurobehavioral health problems1. Metal Dust – Other types of metal dust fall under the other category of the OSHA PEL and must be below 15 mg/m3 of total dust with less than 5 mg/m3 of respirable dust2. Metal dust can cause eye irritation and cause other eye injuries1. For heavy duty use, such as the Tulsa Welding School, Sentry Air Systems recommends the Model 500 Python Heavy Duty Portable Fume Extractor. This unit comes standard with a flexible 12’ hose with options of one, two or four hoses for multiple users. The flexible hose allows the operator to move the hose to be closer to the application. The hose is made of all flame retardant materials making it safe to use in high heat applications. This unit is equipped with the cleanable Micro-Pleat Series 1 Particulate Filter designed for heavy duty applications. This filter can be easily cleaned with pressurized air. The filter is designed with an internal dust pan that collects excess debris and dust allowing the filter to be cleaned without removing it from the system. The Model 500 Python is portable and requires no exterior ducting. This system comes with heavy duty locking casters and is available with a variety of extraction arms. Below are two pictures showing the effectiveness of particulate remove of the Model 500 Python with a picture before the unit is turned on and after. (Left) Before – Plasma cutting fumes without fume extractor turned on. (Right) After – 500 Python Fume Extractor removing harmful fumes from plasma cutting process. For more information, please contact our industry experts for consultation for the best suited solution for your application. 1. Delson, Josh. “Using Dry Filtration to Capture Plasma Cutting Fumes.” The Fabricator, 31 Aug 2016, https://www.thefabricator.com/article/plasmacutting/using-dry-filtration-to-capture-plasma-cutting-fumes. 2. “OSHA Annotated Table Z-1.” Occupational Safety and Health Administration, https://www.osha.gov/dsg/annotated-pels/tablez-1.html.